Part four of a four-part series. Read parts one, two and three. SEDE BOQER, Israel -- In the land of milk and honey, water has always been in short supply. Researchers here have linked temperature rise and drought to migration patterns across this arid region dating back to biblical times. Now, for the first time in its history, Israel is on track to experience a water surplus. The tricky part is scaling up the chemistry and reducing the cost of separating salt from seawater. 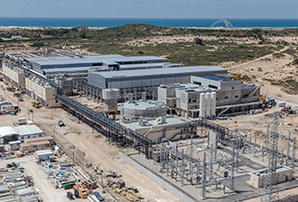 The first major desalination plant in Israel opened in the southern city of Ashkelon in 2005. Since then, four more large-scale seawater desalination plants have come online, with additional capacity in the pipeline. In the span of a decade, desalination has come to produce about 40 percent of Israel's water supply. On its current trajectory, Israel will have access to more than 600 million cubic meters of desalinated water per year by 2015, which amounts to more than half the country's total freshwater needs. Desalination has led to a resource revolution in Israel, said Shlomo Wald, chief scientist at the Ministry of Energy and Water Resources. "Now, Israel isn't always dependent on the mercy of God to give us rain," he said. For the last seven years, Israel has been in a severe drought. The country's largest freshwater resource, the Sea of Galilee, had been hovering around critical lows until the rains returned last year. While Israel's development of desalination has brought an end to years of living with water shortages, it is also opening doors for more peaceful collaboration with Israel's neighbors. "In my opinion, it's a big future also for our neighbors," Shlomo Wald, chief scientist at the Ministry of Energy and Water Resources, said of the desalination boom in an interview. "I think Israel is willing to assist Jordan, Egypt and even the Gaza Strip ... and hopefully in the future Syria and Lebanon. "Water is a crucial commodity in this area. I think all our neighbors should look to this huge technological effort to make water more available to the region," he added. In December, Israel, Jordan and the Palestinian government in the West Bank signed a major agreement to share water resources through desalination. Water produced from a new desalination plant in Aqaba will be divided between Israel and Jordan. The brine waste product will be piped north to the highly saline Dead Sea, where water levels are dropping at a record pace. Mekorot, Israel's water utility, will also sell up to 30 million cubic meters of desalinated water each year to the West Bank. It's in Israel's interest to work with the Palestinians, "because morally it's not healthy to have a thirsty neighbor and politically it's not healthy to have a thirsty neighbor," said Eilon Adar, director of water research at Ben-Gurion University. The Gaza Strip, home to roughly 1.7 million Palestinians, is also in need of new water supplies. Today, 90 to 95 percent of Gaza's sole water source is polluted, according to UNICEF. In addition, overuse and a drastic drop in rainfall have caused wells to dry out. The United Nations has cautioned against withdrawing too much groundwater in Gaza and called for the use of seawater desalination as an alternate source of drinking water. Yousef Abu Mayla, water expert at Al Azhar University in Gaza, said the only way to end the water crisis and realize a desalination plant in Gaza would be to set aside political differences and focus on exchanging expertise. "We need more water, we need clean water," he said. "Climate change in the area affects our water resources and their quality as well. We have a growing population, increasing demand for water for agricultural purposes, industrial drinking, for domestic use for drinking purposes. We have to meet all these requirements with a regional approach, with cooperation and coordination." He added, "If we start to work together on water issues ... we can improve the situation between us, between the Palestinians and Israelis. We cannot wait for the political problems to be solved." By increasing Israel's desalination capacity, water managers won't have to draw on natural resources for everyday usage, allowing the region's aquifers to finally recover, said Eilon Adar, director of the Zuckerberg Institute for Water Research at Ben-Gurion University. In the 1960s, the thirst for water led Israelis to develop highly efficient drip irrigation systems. Today, Israel also treats and recycles more than 80 percent of household wastewater. Spain, which has the second-highest reclamation rate, recycles about 30 percent. These long-standing practices, combined with desalination, have helped Israel "conquer the desert," Adar said, "rather than be pushed away by the desert." Israel now has enough available water that the government has decided to curb production at four of the largest desalination plants. This year, the national water company Mekorot will buy 360 million cubic meters of desalinized seawater, just 70 percent of a total 510 million cubic meters of production capacity. Desalinated water is expensive to make, and desalination plants are extremely capital-intensive to build. So why build them if they're not going to be fully used? "It basically becomes an insurance policy against future extreme drought," said Reese Tisdale, president of Bluefield Research, a U.S.-based water sector research group. It's not a question of when drought will strike again, he said, but how soon. Climate models predict Israel will see a continued decrease in available water resources through 2035. The Organisation for Economic Co-operation and Development anticipates that Israel will see a decrease in precipitation and that water supplies will drop at least 25 percent as early as 2070. "One thing about plants in Israel -- and I think this is in defense of plants being installed -- is that they may have plenty of water now, but the expectation is either drought is going to return or there will at least be some volatility," Tisdale said. Water shortages aren't unique to the Middle East. As populations grow and temperatures rise, demand for fresh water will spike across the globe. For many communities, survival may depend on the ability to economically produce fresh water from the sea. Israeli expertise could play a vital role in expanding water access. Despite its small size, Israel ranks next to the United States and Singapore as a desalination market leader, according to Tisdale. "Israel is the heart of know-how in desalination worldwide," Wald said of the water and energy ministry. "We don't manufacture the membranes, we don't manufacture the pumps. But the engineering and the way a desalination plant should be designed and built, I think, the international hub is here in Israel." Selling to China and the U.S.
Energy is the No. 1 driver of cost in desalination. Due in part to Israel's own resource constraints, Israeli companies have come to offer some of the cheapest desalinated water in the world -- about 60 cents per cubic meter. The establishment of reverse osmosis desalination, which is less energy-intensive than the traditional method of using heat, has helped cut desalination costs across the board. Reverse osmosis works using semipermeable membranes to remove salt from water. Today's membranes are 20 times more efficient and one-fifth the cost of the first membranes tested in the 1950s. Sorek, the world's largest seawater reverse osmosis plant, meets 20 percent of Israel's urban water needs. Photo courtesy of IDE Technologies. IDE Technologies, one of Israel's most prominent desalination companies, has developed ways to further cut costs by using fewer pumps and energy recovery devices. At Israel's Ashkelon desalination plant, for instance, IDE spearheaded a method of generating power by using high-pressure brine to help rotate the pump motor. A standard turbine can recover about 80 percent of input energy; this process boosts energy recovery to 96 percent. IDE has built three of Israel's five largest desalination plants, including the Sorek project that meets 20 percent of Israel's municipal water needs. IDE has also built China's largest desalination plant and is building the largest desalination plant in the United States: a $1 billion facility in Carlsbad, Calif.
Energy recovery technology used at the Carlsbad plant, set to come online in 2016, will save $12 million in annual energy costs. Energy savings will also cut greenhouse gas emissions to the tune of taking 8,500 passenger vehicles off the road for one year. Through additional mitigation steps, the plant is expected to reach carbon neutrality. "Each project that you do ... you think is the end of ends and no one could get more efficient than that," said Avshalom Felber, CEO of IDE Technologies. "And then you yourself come up with another innovation."